Preproposal statement of inquiry was filed as WSR 16-15-073. Title of Rule and Other Identifying Information: Chapter 173-98 WAC, Uses and limitations of the water pollution control revolving fund and chapter 173-95A WAC, Uses and limitations of the centennial clean water program. Hearing Location(s): Department of Ecology, 300 Desmond Drive, Lacey, WA 98503, on May 31, 2017, at 1:00 p.m. The hearing will include a presentation and a question and answer session followed by the formal public hearing. Webinar: Ecology is also offering the hearing via webinar. Webinars are an online meeting forum that you can attend from any computer using internet access. To join the webinar click on the following link for more information and instructions https://wadis.webex.com/wadis/j.php?RGID=rcac981bd94bf44f68fee7cca7aacbe1f. Comments: Ecology will accept comments at Lacey and through the webinar. Date of Intended Adoption: August 2, 2017. Submit Written Comments to: Daniel Thompson, Department of Ecology, Water Quality Program, P.O. Box 47600, Olympia, WA 98504-7600, submit comments online at http://ws.ecology.commentinput.com/?id=vM3e3, by June 7, 2017. Assistance for Persons with Disabilities: Contact water quality program by June 6, 2017, TTY (877) 833-6341 or (360) 407-6600. Takes advantage of new funding opportunities consistent with state and federal updates. Reasons Supporting Proposal: The proposed rules will clarify, simplify, and provide more flexibility for ecology and funding applicants/recipients. Statutory Authority for Adoption: Chapters 90.50A and 70.146 RCW. Statute Being Implemented: Chapters 90.50A and 70.146 RCW. Name of Agency Personnel Responsible for Drafting and Implementation: Daniel Thompson, Lacey, (360) 407-6510. No small business economic impact statement has been prepared under chapter 19.85 RCW. Ecology analyzed the compliance costs of this rule making. Based on this analysis we determine the proposed rules do not impose more than minor costs on businesses in an industry, as the proposed rule amendments are not likely to impose any additional costs on businesses. Therefore, we are not required to prepare a small business economic impact statement (RCW 19.85.030(1)(a)). A cost-benefit analysis is required under RCW 34.05.328. A preliminary cost-benefit analysis may be obtained by contacting Daniel Thompson, Department of Ecology, Water Quality Program, P.O. Box 47600, Olympia, WA 98504-7600, phone (360) 407-6510, email daniel.thompson@ecy.wa.gov. WAC 173-95A-015 Integrated funding approach. (1) Where possible, the Washington state department of ecology combines the management of the centennial program with other funding programs, such as the water pollution control revolving fund, the stormwater financial assistance program, and the Clean Water Act section 319 nonpoint source program. (2) The integrated funding process includes a combined funding cycle, program guidelines, funding offer and applicant list, and statewide funding workshops. (1) Activities see water pollution control activities. (2) Applicant means a public body that has applied for funding. (3) Best management practices (BMP) means physical, structural, and/or managerial practices approved by the department that prevent or reduce pollutant discharges. (4) Cash match means ((moneys)) funds used to match the state share of a grant. (5) Ceiling amount means the highest level of financial assistance the department can provide to a recipient for an individual project. (6) Centennial means the centennial clean water program. (7) Commercial, industrial, and institutional flows mean the portion of the total flows to a facility that originate from large commercial establishments, industrial facilities, or institutional sources such as state schools, hospitals, and prisons. (8) Competitive funding means ((moneys)) funds available for projects through a statewide evaluation process. (9) Completion date or expiration date means the date indicated in the funding agreement in which all milestones and objectives associated with the goals of the project are met. (d) An animal livestock feeding operation designated by the Environmental Protection Agency as polluting the waters of Washington state. (11) Conservation easement means a recorded legal agreement between a landowner and a public body to allow or restrict certain activities and uses that may take place on his or her property. (12) Conservation plan means a document that outlines how a project site will be managed using best management practices to avoid potential negative environmental impacts. (13) Construction means to erect, install, expand, or improve water pollution control facilities or activities. Construction includes construction phase engineering and preparation of the operation and maintenance manual. (14) Cost-effective alternative means the option selected in an approved ((facilities plan)) planning document that meets the requirements of the project, recognizes environmental and other nonmonetary impacts, and offers the lowest cost over the life of the project (i.e., ((lowest present worth or equivalent annual value)) life cycle cost). (15) Department means the Washington state department of ecology. (16) Design means the preparation of the plans and specifications used for construction of water pollution control facilities or activities. (17) Director means the director of the Washington state department of ecology or his or her authorized designee. (18) Draft offer and applicant list means a catalog of all applications for financial assistance considered and those proposed for funding, based on estimates of state and federal budgets. (19) Easement means a recorded legal agreement between a public body and a landowner that allows the public body to have access to the landowner's property at any time to inspect, maintain, or repair loan-or-grant-funded activities or facilities; sewer use ordinances and other legal documents may be sufficient. (20) Effective date means the date the loan or grant agreement is signed by the department's water quality program manager. 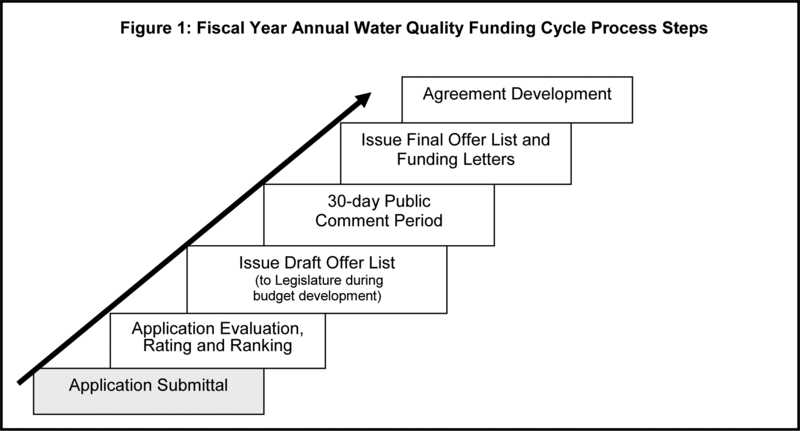 (21) Eligible cost means the portion of a facilities or activities project that can be funded based on program eligibility as defined in WAC 173-98-100 and in the most recently updated edition of the Water Quality Financial Assistance Guidelines (publication #10-10-049). (22) Enforcement order means an administrative requirement issued by the department under the authority of RCW 90.48.120 that directs a public body to complete a specified course of action within an explicit period to achieve compliance with the provisions of chapter 90.48 RCW. (23) ((Engineering report means a document that includes an evaluation of engineering and other alternatives that meet the requirements in chapter 173-240 WAC, Submission of plans and reports for construction of wastewater facilities. (24))) Environmental degradation means the reduced capacity of the environment to meet social and ecological objectives and needs. (((25))) (24) Environmental emergency means a problem that a public body and the department agree poses a serious, immediate threat to the environment or to the health or safety of a community and requires immediate corrective action. (((26))) (25) Equivalent residential unit (ERU) means a unit of measurement used to express the average sewage loading discharged from a typical full-time single-family dwelling unit. (((27))) (26) Estimated construction cost means the expected amount for labor, materials, equipment, and other related work necessary to construct the proposed project. (((28))) (27) Existing need means water pollution control facility's capacity reserved for all users, at the time of application. (c) Will bear the financial burden of paying for the new facility. (((30))) (29) Extended grant payments means cash disbursements for eligible project costs made with equal annual payments as established in RCW 70.146.075. (((31))) (30) Facilities see water pollution control facility. (((32) Facilities plan means an engineering report that includes all the elements required by the state environmental review process (SERP), National Environmental Policy Act (NEPA) as appropriate, other federal statutes, and planning requirements under chapter 173-240 WAC. (33))) (31) Final offer and applicant list means a catalog of all applications for financial assistance considered and those offered funding, based on adopted state and federal budgets. (((34))) (32) Force account means loan or grant project work performed using labor, materials, or equipment of a public body. (((35))) (33) Funding cycle means the events related to the competitive process used to allocate ((moneys)) funds from the water pollution control revolving fund, centennial clean water program, the stormwater financial assistance program, and the Clean Water Act section 319 nonpoint source program for a state fiscal year. (((36))) (34) Grant agreement means a contractual arrangement between a public body and the department. (((37))) (35) Growth means the portion of the flows to a facility reserved for future residential, commercial, industrial, or institutional flows. (((38))) (36) Indirect cost means costs that benefit more than one activity of the recipient and not directly assigned to a particular project objective. (((39))) (37) In-kind contributions means the value of noncash contributions provided for a project. (((40))) (38) Interlocal agreement means a written arrangement between a grant recipient and another public body to provide eligible grant match contributions to a project. Interlocal agreements are subject to chapter 39.34 RCW, Interlocal Cooperation Act. (((41))) (39) Interlocal costs means the value of goods or services provided to a project by a public body under the terms of an interlocal agreement. Interlocal contributions satisfy cash matching requirements. (((42))) (40) Infiltration and inflow means water, other than wastewater, that enters a sewer system. (((43))) (41) Infiltration and inflow correction means the cost-effective alternative or alternatives identified in an approved ((facilities plan or engineering report)) planning document for eliminating or reducing the infiltration and inflow to an existing sewer system. (((44))) (42) Landowner agreement means a written arrangement between a public body and a landowner that allows the public body to have access to the property to inspect project-related components. (((45))) (43) Loan agreement means a contractual arrangement between a public body and the department that involves a disbursement of ((moneys)) funds that must be repaid. (((46))) (44) Loan default means failure to make a loan repayment to the department within sixty days after the payment was due. (((47))) (45) Match means the recipient share of eligible project costs. (((48))) (46) Nonpoint source water pollution means pollution that enters any waters from widespread water-based or land-use activities. Nonpoint source water pollution includes, but is not limited to, atmospheric deposition; surface water runoff from agricultural lands, urban areas, and forest lands; subsurface or underground sources; and discharges from boats or other marine vessels. (((49))) (47) Plans and specifications means the construction contract documents and supporting engineering documents prepared in sufficient detail to allow contractors to bid on and construct water pollution control facilities. "Plans and specifications" and "design" may be used interchangeably. (((50))) (48) Preliminary project priority list means a catalog of all applications for financial assistance considered for funding and submitted to the Washington state legislature for its consideration during budget development. (((51))) (49) Project means a water quality improvement effort funded with a grant or loan. (((52))) (50) Project completion or expiration means the date indicated in the funding agreement in which all milestones and objectives associated with the goals are met. (((53))) (51) Public body means a state of Washington county, city or town, conservation district, other political subdivision, municipal corporation, quasi-municipal corporation, those Indian tribes recognized by the federal government, or institutions of higher education when the proposed project is not part of the school's statutory responsibility. (((54))) (52) Public health emergency means a situation declared by the Washington state department of health in which illness or exposure known to cause illness is occurring or is imminent. (((55))) (53) Recipient means a public body that has an effective loan or grant agreement with the department. (((56))) (54) Residential means the portion of the total flows to a facility that originates from single family houses, apartments, mobile home parks, small commercial facilities, and community facilities such as local K-12 public schools, libraries, and fire stations. (((57))) (55) Revolving fund means Washington state's water pollution control revolving fund. (((58))) (56) Riparian buffer or zone means a swath of vegetation along a channel bank that provides protection from the erosive forces of water along the channel margins and external nonpoint sources of pollution. (((59))) (57) Scope of work means a detailed description of project tasks, milestones, and measurable objectives. (((60))) (58) Service area population means the number of people served in the area of the project. (((61))) (59) Severe public health hazard means a situation declared by the Washington state department of health in which the potential for illness exists, but illness is not occurring or imminent. (((62))) (60) Sewer means the pipe and related pump stations located on public property or on public rights of way and easements that convey wastewater from buildings. (((63))) (61) Side sewer means a sanitary sewer service extension from the point five feet outside the building foundation to the publicly owned collection sewer. (((64))) (62) State environmental review process (SERP) means the National Environmental Policy Act (NEPA)-like environmental review process adopted to comply with the requirements of the Environmental Protection Agency's Code of Regulations (40 C.F.R. § 35.3140). SERP combines the State Environmental Policy Act (SEPA) review with additional elements to comply with federal requirements. (((65))) (63) Total eligible project cost means the sum of all expenses associated with a water quality project that are eligible for funding. (((66))) (64) Total project cost means the sum of all expenses associated with a water quality project. (((67))) (65) Water pollution means contamination or other alteration of the physical, chemical, or biological properties of any waters of the state, including change in temperature, taste, color, turbidity, or odor; or any discharge of a liquid, gas, solid, radioactive substance, or other substance into any waters of the state that creates a nuisance or renders the waters harmful, detrimental, or injurious to the public, to beneficial uses, or to livestock, wild animals, birds, fish, or other aquatic life. (d) To maintain or improve water quality through the use of water pollution control facilities or other means. (((69))) (67) Water pollution control facility or facilities means any facilities or systems for the control, collection, storage, treatment, disposal, or recycling of wastewater((,)) including, but not limited to, sanitary sewage, stormwater, residential, commercial, industrial, and agricultural wastes. Facilities include all necessary equipment, utilities, structures, real property, and interests in and improvements on real property. (((70))) (68) Water resource inventory area (WRIA) means one of the watersheds in the state of Washington, each composed of the drainage areas of a stream or streams, as established in the Water Resources Management Act of 1971 (chapter 173-500 WAC). WAC 173-95A-100 Grant and loan eligible. WAC 173-95A-110 Loan only eligible. (((7))) (8) Transferring ownership of a small wastewater system to a public body. WAC 173-95A-120 Projects ineligible for centennial program funding. (((27))) (26) Water quantity or other water resource projects that solely address water quantity issues such as reservoirs and dams. WAC 173-95A-200 Centennial clean water program loan interest rates. ((The department bases loan recipient interest rates on the average market interest rate. The average market interest rate is based on the daily market rate published in the bond buyer's index for tax-exempt municipal bonds for the period from sixty to thirty days before the annual funding application cycle begins. See WAC 173-95A-400 for hardship interest rates. Thirty percent of the average market rate. Loan interest rates are determined by the provisions in WAC 173-98-400. WAC 173-95A-300 Application for funding. (1) To apply for funding the applicant must submit a completed application to the department. The department will provide the application on the department web site. (k) Other information requested by the department. (3))) Minimum score on application. (a) An applicant must receive a minimum score equal to fifty percent of the available points on ((section three,)) the water quality and public health improvements form, of the water quality financial assistance application to be rated for the Draft Offer and Applicant List and Final Offer and Applicant List. ((An applicant with fewer than fifty percent of the points available on section three of the application is not eligible for funding consideration.)) The department may offer funding to applicants with fewer than fifty percent of the points available on ((section three)) the form if demand for funding is low. (b) An applicant must receive a minimum score equal to sixty percent of the available points on the water quality financial assistance application to be eligible for funding consideration. The department may offer funding to applicants with fewer than sixty percent of the points available on the financial assistance application if demand for funding is low. WAC 173-95A-310 ((Ecology's)) The department's responsibilities. (1) A general funding cycle schedule is provided in Figure 1. (((n))) (l) Negotiate, develop, and finalize loan or grant agreements. WAC 173-95A-320 Final offer and applicant list. Loan and grant offers identified on the Final Offer and Applicant List will be effective for up to one year from the publication date of the Final Offer and Applicant List. Loan and grant offers that do not result in a signed agreement ((are automatically)) may be ended. WAC 173-95A-400 Wastewater ((treatment)) facilities construction. (c) Level of financial burden placed on the ratepayers. (2) Service area population. Applicants serving an area of twenty-five thousand or less can request hardship-funding consideration by submitting a financial hardship analysis form, provided by the department, along with the grant and loan funding application. If the service area population is different from the population of the applicant, the applicant must show that the hardship assistance is solely used to benefit the population of the service area. (3) Existing residential need. Water pollution control facilities construction costs that are associated with existing residential need at the time of application may be eligible for funding. Additional reserve capacity for growth is not eligible for grant funding. (4) Level of financial burden. (e) If the applicant disputes the data used by the department, the department may allow an applicant to conduct a scientific survey to determine the MHI for the project area. (5) Hardship grant ceiling amounts. The department uses the grant hardship-funding continuum, shown in figure 2 below, to determine the percent of grant awarded. There is a funding ceiling of five million dollars per project. When a grant applicant with a service area population of twenty-five thousand or less can demonstrate that its sewer user rates for the proposed project are between three and five percent of the median household income, the applicant may receive a grant of seventy-five percent of eligible project costs, not to exceed five million dollars (see figure 2 below). (6) If a project in the hardship category receives partial funding due to department funding constraints, the department may offer the remaining funding, up to five million dollars, in the next funding cycle, and on a case-by-case basis. The department may require further hardship analysis before offering the remaining moneys. (7) Loan terms and interest rates. The department uses the loan hardship-funding continuum, shown in figure 2 below, to determine the hardship-loan interest rates. There is a funding ceiling of five million dollars. In addition to a reduced interest rate, the applicant may receive longer loan repayment terms, not to exceed twenty years. Assuming that the average market rate for tax-exempt municipal bonds is five percent, the following would apply. When a loan applicant with a service area population of twenty-five thousand or less can demonstrate that its sewer user rates for the proposed project are between three and five percent of the median household income, the applicant may be eligible for a twenty-year repayment term and a one percent interest rate. This interest rate represents twenty percent of the average market rate for tax-exempt municipal bonds (see figure 3 below). (9) Extended grant payments. In some cases, the legislature may appropriate extended grant payments per RCW 70.146.075. Financial hardship for wastewater facilities construction is determined by the provisions in WAC 173-98-300. There are two project categories in which the competitive funding is allocated: Activities and facilities. (b) To comply with funding restrictions in legislative appropriations. If fifty percent of the competitive centennial program funding is comprised of state building construction account ((moneys)) funds, then fifty percent of the centennial program funding must be allocated to projects approved for that funding source. (1) The recipient must acknowledge department funding in reports, technical documents, publications, brochures, and other materials. (c) Five hundred thousand dollars for activities project loans. (2) Facilities projects. Loans are subject to ceiling amounts of five million dollars. (b) Grants for facilities planning and design may not exceed fifty percent of the total eligible costs. (4) Water pollution control facilities construction bid overruns. (c) First priority for availability of ((moneys)) funds will be given to hardship communities based on the severity of financial need. For more information, see WAC 173-95A-400. (((c))) (d) First priority for availability of ((moneys)) funds will be given to hardship communities based on the severity of financial need. For more information on hardship, see WAC 173-95A-400. (1) Depending on the grant amount, match can consist of cash or interlocal and in-kind contributions that total twenty-five percent of the total eligible project cost. (2) No match is required for loans under the centennial program. (3) No match is required for grants for wastewater facility hardship projects. WAC 173-95A-540 Step process for facilities. (((1) The step process is required for facilities construction projects. The process begins with site-specific planning, and continues through design to construction or implementation. At the time of application, all previous steps must be approved by the department. Draft documents must be sent to the department's engineers at least sixty days before end of application cycle for approval by end of application cycle. Funding for one step does not guarantee the future funding of subsequent steps. (c) Construction (step three): Step three includes the actual building of facilities based on the approved design. Design must be approved by the department before an application for construction can be considered for funding. The applicant must also have a current rate study that includes the proposed project before an application for construction can be considered for funding. The utility rate proposed in the rate study must be adequate to pay for O&M, debt service, and replacement of short lived assets, and any other associated project costs. The applicant must have an adopted fee ordinance based on the current rate study that includes the proposed project before the department will sign a loan agreement. (3) Combined steps for smaller design-bid-construct projects (step four): In some cases, design and construction may be combined into one loan. Step four applicants must demonstrate that step two (design) can be completed and approved by the department within one year of the effective date of the funding agreement. The applicant must also complete a rate study that includes the proposed project and adopt a fee ordinance based on the rate study before the department will approve plans and specifications as required in WAC 173-98-560, approval of plans and specifications. The utility rate proposed in the rate study must be adequate to pay for O&M, debt service, and replacement of short lived assets, and any other associated project costs. The total project costs for step four projects must be five million dollars or less. (b) The proposed project would remedy this situation. No loan agreement will be signed until all previous steps have been completed and approved by the department.)) Wastewater facility projects must follow the step process provisions in WAC 173-98-530. WAC 173-95A-550 Commercial, industrial, and institutional flows. (1) The portion of a project designed to serve the needs of commercial, industrial, and institutional customers may be funded using loans only. (2) Capacity to serve local public primary and secondary schools may be grant eligible if the applicant can demonstrate financial hardship according to WAC ((173-95A-400)) 173-98-300. WAC 173-95A-560 ((Step)) Process for water pollution control activities. The ((step)) following process is required for lake projects and recommended for all water pollution control activities projects. (1) Planning involves the identification of problems ((and)), evaluation of cost-effective alternatives in accordance with WAC 173-98-730, and preparation of a planning document. (1) Recipients must fully comply with all applicable federal, state, and local laws and rules relating to topics such as procurement, discrimination, labor, job safety, drug-free environments, and minority and women owned businesses. (2) Ongoing management of most aspects of loan projects is subject to the most recent edition of Administrative Requirements for Recipients of Ecology Grants and Loans (publication #91-18) or Administrative Requirements for Recipients of Ecology Grants and Loans Managed in EAGL (publication #14-01-002). (3) Ongoing management of all aspects of loan projects is subject to the associated funding program guidelines. (4) The applicant shall secure all necessary permits required by authorities having jurisdiction over the project. Copies must be available to the department upon request. WAC 173-95A-610 The Growth Management Act. (c) The department has determined that the project is designed to address only the public health need or substantial environmental degradation described in the documentation, and does not address unrelated needs including, but not limited to, provisions for additional growth. (2) For the purposes of this section, "compliance with the Growth Management Act" means that((:)) a county, city, or town that must or chooses to plan under RCW 36.70A.040 and has adopted a comprehensive plan, including a capital facilities plan element, and development regulations as required by chapter 36.70A RCW. (c) The problem cannot be corrected through more efficient operation and maintenance of an existing wastewater disposal system or systems. WAC 173-95A-700 Starting a project. ((Costs incurred before a grant or loan agreement is effective are not eligible for reimbursement, unless prior authorization is granted by the department. (1) Prior authorization to incur costs. (c) Any project costs incurred before the publication date of the Final Offer and Applicant List are not eligible for reimbursement. All costs incurred before the agreement is signed by the water quality program manager are at the applicant's own risk. (a) Work on a project must be started within ((sixteen)) ten months of the publication date of the Final Offer and Applicant List on which the project was proposed. (b) Starting a project means making any measurable steps toward achieving the milestones, objectives, and overall goals of the project. (((c) Loan and grant offers identified on the Final Offer and Applicant List will be effective for up to one year from the publication date of the Final Offer and Applicant List. Loan and grant offers that do not result in a signed agreement are automatically ended, see WAC 173-95A-320. (b) There is a need to do work during an environmental window in a specific season of the year. WAC 173-95A-800 Accounting requirements for grant and loan recipients. (1) Recipients must maintain ((accounting records in accordance with RCW 43.09.200, Local government accounting—Uniform system of accounting. For example, charges must be properly supported, related to eligible costs, and documented by appropriate records. These records must be maintained separately)) accurate records and accounts for the project in accordance with Generally Accepted Accounting Principles (GAAP) as issued by the Governmental Accounting Standards Board (GASB), including standards related to the reporting of infrastructure assets, or in accordance with the state standards in RCW 43.09.200 Local government accounting—Uniform system of accounting. (2) Accounting irregularities may result in an immediate payment hold. The director may require immediate repayment of misused loan or grant ((moneys)) funds. WAC 173-95A-810 Appealing a department decision. If a dispute arises concerning eligibility decisions made by the department within the context of a loan agreement, the decision may be appealed. A lawsuit cannot be brought to superior court unless the aggrieved party follows these procedures, which are intended to encourage the informal resolution of disputes consistent with RCW 34.05.060. (6) Unless all parties to the appeal agree that a different time frame is appropriate, the parties shall attempt to bring the matter for a superior court determination within four months of the date in which the administrative record is filed with the court. This time frame is to ensure minimal disruptions to the program. WAC 173-95A-820 Audit requirements for grant and loan recipients. The department, or at the department's discretion another authorized auditor, ((will)) may audit the grant or loan agreement and records. Approval of plans and specifications. The purpose of this chapter is to set forth requirements for the Washington state department of ecology's (department) administration of Washington state's water pollution control revolving fund (revolving fund), and the water pollution control revolving administration account (administration account) as authorized by chapter 90.50A RCW, water pollution control facilities ((financing)) federal capitalization grants. The revolving fund is primarily comprised of federal capitalization grants, state matching ((moneys)) funds, and principal and interest repayments. It is used to provide loan assistance to public bodies for statewide, high-priority water quality projects that are consistent with the Clean Water Act, 33 U.S.C. ((1251-1387)) 1251-1388. (2) Information and data system costs associated with loan tracking and fund management. At the point where the administration account adequately covers the program administration costs, the department may no longer use the federal administration allowance. If a federal capitalization grant is awarded after that point, all federal capitalization grant dollars must be used for making loans. WAC 173-98-020 Integrated funding approach. (1) Where possible, the department combines the management of the revolving fund with other funding programs, such as the centennial clean water program, the stormwater financial assistance program, and the federal Clean Water Act section 319 nonpoint source program. (1) Act means the federal Clean Water Act (33 U.S.C. ((1251-1387)) 1251-1388). (2) Activities, see water pollution control activities. (3) Annual debt service means the amount of debt the applicant is obligated to pay on the loan in one year. (4) Applicant means a public body that has applied for funding. (5) Best management practices (BMP) means physical, structural, and/or managerial practices approved by the department that prevent or reduce pollutant discharges. (6) Capitalization grant means a federal grant awarded by the U.S. Environmental Protection Agency (EPA) to the state to help expand the revolving fund. (7) Ceiling amount means the highest level of financial assistance the department can provide to a recipient for an individual project. (8) Commercial, industrial, and institutional flows mean the portion of the total flows to a facility that originate from large commercial establishments, industrial facilities, or institutional sources such as state schools, hospitals, and prisons. (9) Competitive funding means ((moneys)) funds available for projects through a statewide evaluation process. (10) Completion date or expiration date means the date indicated in the funding agreement in which all milestones and objectives associated with the goals of the project are met. (12) Conservation easement means a recorded legal agreement between a landowner and a public body to allow or restrict certain activities and uses that may take place on his or her property. (13) Conservation plan means a document that outlines how a project site will be managed using best management practices to avoid potential negative environmental impacts. (14) Construction means to erect, install, expand, or improve water pollution control facilities or activities. Construction includes construction phase engineering and preparation of the operation and maintenance manual. (15) Cost-effective alternative means the option selected in an approved ((facilities plan)) planning document that meets the requirements of the project, recognizes environmental and other nonmonetary impacts, and offers the lowest cost over the life of the project (i.e., ((lowest present worth or equivalent annual value)) life cycle cost). (16) Debt service means the total of all principal, interest, and administration charges associated with a water pollution control revolving fund loan that must be repaid to the department by the public body. (17) Department means the Washington state department of ecology. (18) Design means the preparation of the plans and specifications used for construction of water pollution control facilities or activities. (19) Director means the director of the Washington state department of ecology or his or her authorized designee. (20) Draft offer and applicant list means a catalog of all applications for financial assistance considered and those proposed for funding, based on estimates of state and federal budgets. (21) Easement means a recorded legal agreement between a public body and a landowner that allows the public body to have access to the landowner's property at any time to inspect, maintain, or repair loan-funded activities or facilities; sewer use ordinances and other legal documents may be sufficient. (22) Effective date means the date the loan agreement is signed by the department's water quality program manager. 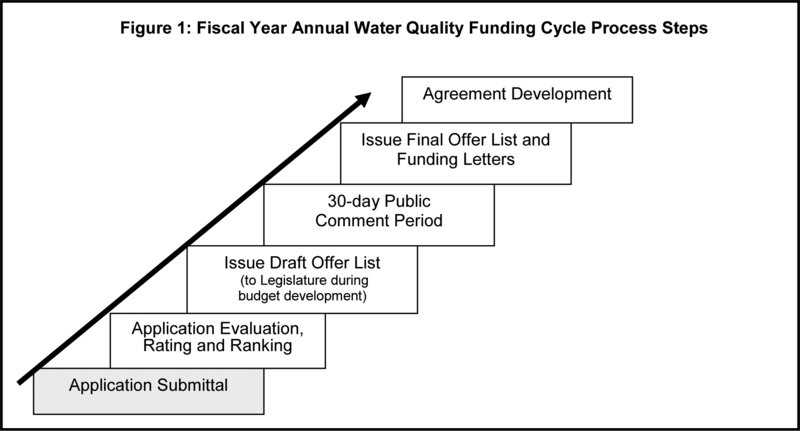 (23) Eligible cost means the portion of a facilities or activities project that can be funded based on program eligibility as defined in WAC 173-98-100 and in the most recently updated edition of the Water Quality Financial Assistance Guidelines (publication # 10-10-049). (24) Energy efficiency means the use of improved technologies and practices to reduce the energy consumption of water quality projects, use energy in a more efficient way, and produce/use renewable energy. (25) Enforcement order means an administrative requirement issued by the department under the authority of RCW 90.48.120 that directs a public body to complete a specified course of action within an explicit period to achieve compliance with the provisions of chapter 90.48 RCW. (26) ((Engineering report means a document that includes an evaluation of engineering and other alternatives that meet the requirements in chapter 173-240 WAC. (27))) Environmental degradation means the reduced capacity of the environment to meet social and ecological objectives and needs. (((28))) (27) Environmental emergency means a problem that a public body and the department agree poses a serious, immediate threat to the environment or to the health or safety of a community and requires immediate corrective action. (((29))) (28) Environmentally innovative means projects that demonstrate new or innovative approaches to managing water quality issues in a more sustainable way. (((30))) (29) Equivalent residential unit (ERU) means a unit of measurement used to express the average sewage loading discharged from a typical full-time single-family dwelling unit. (((31))) (30) Estimated construction cost means the expected amount for labor, materials, equipment, and other related work necessary to construct the proposed project. (((32))) (31) Existing need means water pollution control facility's capacity reserved for all users, at the time of application. (((34))) (33) Facilities, see water pollution control facility. (((35) Facilities plan means an engineering report that includes all the elements required by the state environmental review process (SERP), National Environmental Policy Act (NEPA) as appropriate, other federal statutes, and planning requirements under chapter 173-240 WAC. (36))) (34) Federal capitalization grant, see capitalization grant. (((37))) (35) Final offer and applicant list means a catalog of all applications for financial assistance considered and those offered funding, based on adopted state and federal budgets. (((38))) (36) Force account means loan project work performed using labor, materials, or equipment of a public body. (((39))) (37) Forgivable principal means the portion of a loan made by the department that is not required to be paid back by the borrower if allowable by the act or Congress through federal appropriation. (((40))) (38) Funding category see "water pollution control activities funding category," "water pollution control facilities funding category," and "preconstruction funding category((," and "green project reserves funding category))." (((41))) (39) Funding cycle means the events related to the competitive process used to allocate ((moneys)) funds from the revolving fund, centennial clean water program, stormwater financial assistance program, and the Clean Water Act section 319 nonpoint source program for a state fiscal year. (((42))) (40) General obligation debt means an obligation of the recipient secured by annual ad valorem taxes levied by the recipient and by the full faith, credit, and resources of the recipient. (((43))) (41) Green infrastructure means a wide array of practices at multiple scales that manage wet weather and that maintain and restore natural hydrology by infiltrating, evapotranspiring and harvesting and using stormwater. (((44))) (42) Green project reserve((s)) means water efficiency, energy efficiency, green infrastructure, and environmentally innovative projects. (((45) Green project reserves funding category means that portion of the revolving fund dedicated to green project reserves projects. (46))) (43) Growth means the portion of the total flows to a facility that is reserved for future residential, commercial, industrial, and institutional flows. (((47))) (44) Indirect cost means costs that benefit more than one activity of the recipient and not directly assigned to a particular project objective. (((48))) (45) Infiltration and inflow means water, other than wastewater, that enters a sewer system. (((49))) (46) Infiltration and inflow correction means the cost-effective alternative or alternatives and the associated corrective actions identified in an approved ((facilities plan or engineering report)) planning document for eliminating or reducing the infiltration and inflow to existing sewer system. (((50))) (47) Initiation of operation means the actual date the recipient begins using, or could begin using, the facilities for its intended purpose. This date may occur before final inspection or project completion. (((51))) (48) Intended use plan means a document identifying the types of projects proposed and the amount of all money available for financial assistance from the revolving fund for a fiscal year as described in section 606(c) of the act. (((52))) (49) Landowner agreement means a written arrangement between a public body and a landowner that allows the public body to have access to the property to inspect project-related components. (((53))) (50) Loan agreement means a contractual arrangement between a public body and the department that involves a disbursement of ((moneys)) funds that must be repaid. (((54))) (51) Loan default means failure to make a loan repayment to the department within sixty days after the payment was due. (((55))) (52) Nonpoint source water pollution means pollution that enters any waters from widespread water-based or land-use activities. Nonpoint source water pollution includes, but is not limited to atmospheric deposition; surface water runoff from agricultural lands, urban areas, and forest lands; subsurface or underground sources; and discharges from some boats or other marine vessels. (((56))) (53) Perpetuity means ((the point at which the revolving fund is earning at least fifty percent of the market rate for tax-exempt municipal bonds on its loan portfolio. (57))) the department will seek to manage the revolving fund account so that available future funds at least match the rate of growth of Engineering News-Record "Construction Cost Index" for the city of Seattle. (54) Plans and specifications means the construction contract documents and supporting engineering documents prepared in sufficient detail to allow contractors to bid on and construct water pollution control facilities. "Plans and specifications" and "design" may be used interchangeably. (((58))) (55) Preconstruction means facility planning, facility design, rate studies, value engineering, sewer use ordinances, and utility formation. (((59))) (56) Preconstruction funding category means that portion of the revolving fund dedicated to preconstruction projects. (((60))) (57) Preliminary project priority list means a catalog of all applications for financial assistance considered for funding and submitted to the Washington state legislature for its consideration during budget development. (((61))) (58) Project means a water quality improvement effort funded with a grant or loan. (((62))) (59) Project completion or expiration means the date indicated in the funding agreement in which all milestones and objectives associated with the goals are met. (((63))) (60) Public body means a state of Washington county, city or town, conservation district, other political subdivision, municipal corporation, quasi-municipal corporation, those Indian tribes recognized by the federal government, or institutions of higher education when the proposed project is not part of the school's statutory responsibility. (((64))) (61) Public health emergency means a situation declared by the Washington state department of health in which illness or exposure known to cause illness is occurring or is imminent. (((65))) (62) Recipient means a public body that has an effective loan agreement with the department. (((66))) (63) Reserve account means an account created by the recipient to secure the payment of the principal and interest on the revolving fund loan. (((67))) (64) Residential means the portion of the total flows to a facility that originates from single-family houses, apartments, mobile home parks, small commercial facilities, and community facilities such as local K-12 public schools, libraries, and fire stations. (((68))) (65) Revenue-secured debt means an obligation of the recipient secured by a pledge of the revenue of a utility. (((69))) (66) Revolving fund means Washington state's water pollution control revolving fund. (((70))) (67) Riparian buffer or zone means a swath of vegetation along a channel bank that provides protection from the erosive forces of water along the channel margins and external nonpoint sources of pollution. (((71))) (68) Scope of work means a detailed description of project tasks, milestones, and measurable objectives. (((72))) (69) Senior lien obligations means all revenue bonds and other obligations of the recipient outstanding on the date of execution of a loan agreement (or subsequently issued on a parity therewith, including refunding obligations) or issued after the date of execution of a loan agreement having a claim or lien on the gross revenue of the utility prior and superior to the claim or lien of the loan, subject only to maintenance and operation expense. (((73))) (70) Service area population means the number of people served in the area of the project. (((74))) (71) Severe public health hazard means a situation declared by the Washington state department of health in which the potential for illness exists, but illness is not occurring or imminent. (((75))) (72) Sewer means the pipe and related pump stations located on public property, or on public rights of way and easements that convey wastewater from buildings. (((76))) (73) Side sewer means a sanitary sewer service extension from the point five feet outside the building foundation to the publicly owned collection sewer. (((77))) (74) State environmental review process (SERP) means the National Environmental Policy Act (NEPA)-like environmental review process adopted to comply with the requirements of the Environmental Protection Agency's Code of Regulations (40 C.F.R. § 35.3140). SERP combines the State Environmental Policy Act (SEPA) review with additional elements to comply with federal requirements. (((78))) (75) Total eligible project cost means the sum of all expenses associated with a water quality project that are eligible for funding. (((79))) (76) Total project cost means the sum of all expenses associated with a water quality project. (((80))) (77) Water efficiency projects means the use of improved technologies and practices to deliver equal or better water quality services with less water. Water efficiency encompasses conservation and reuse efforts, as well as water loss reduction and prevention, to protect water resources for the future. (((81))) (78) Water pollution means contamination or other alteration of the physical, chemical, or biological properties of any waters of the state, including change in temperature, taste, color, turbidity, or odor of the waters; or any discharge of a liquid, gas, solid, radioactive substance, or other substance into any waters of the state that creates a nuisance or renders the waters harmful, detrimental, or injurious to the public, to beneficial uses, or to livestock, wild animals, birds, fish, or other aquatic life. (((83))) (80) Water pollution control activities funding category means that portion of the revolving fund dedicated to nonpoint source pollution projects. (((84))) (81) Water pollution control facility or facilities means any facilities or systems for the control, collection, storage, treatment, disposal, or recycling of wastewater, including, but not limited to, sanitary sewage, stormwater, residential, commercial, industrial, and agricultural wastes. Facilities include all necessary equipment, utilities, structures, real property, and interests in and improvements on real property. (((85))) (82) Water pollution control facilities funding category means that portion of the revolving fund dedicated to facilities projects. (((86))) (83) Water pollution control revolving fund (revolving fund) means the water pollution control revolving fund established by RCW 90.50A.020. (((87))) (84) Water resource inventory area (WRIA) means one of the watersheds in the state of Washington, each composed of the drainage areas of a stream or streams, as established in the Water Resources Management Act of 1971 (chapter 173-500 WAC). WAC 173-98-040 Revolving fund uses. (((8))) (7) To provide loan subsidies in the form of reduced interest rates and forgivable principal to public bodies for statewide, high-priority water quality projects that are consistent with the Clean Water Act, 33 U.S.C. ((1251-1387)) 1251-1388. (c) Other water quality best management practices that are evaluated and approved by the department on a case-by-case basis, and where a conservation easement or landowner agreement is granted by the landowner. (iii) Facilities planning for water pollution control facilities((;)). (vi) New sewer systems to eliminate failing or failed on-site sewage systems;)). (e) Design or construction costs associated with design-build or design-build-operate contracts)). (e) For drinking water source protection. (c) Local loan fund program development and implementation((;)). (((40))) (41) Water quality education and stewardship programs. (((32))) (30) Water quantity or other water resource projects that solely address water quantity issues such as reservoirs and dams. WAC 173-98-200 Application for funding. (1) To apply for funding, the applicant must submit a completed application to the department. The department will provide the application on the department web site. (b) An applicant must also receive a minimum score equal to sixty percent of the available points on the entire water quality financial assistance application to be eligible for funding consideration. The department may offer funding to applicants with fewer than sixty percent of the points available on the financial assistance application if demand for funding is low. WAC 173-98-210 ((Ecology's)) The department's responsibilities. (((n))) (l) Negotiate, develop, and finalize loan agreements. WAC 173-98-220 Final offer and applicant list. Loan offers identified on the Final Offer and Applicant List will be effective for up to one year from the publication date of the Final Offer and Applicant List. Loan offers that do not result in a signed agreement ((are automatically)) or a letter of binding commitment may be ended. WAC 173-98-230 Revolving fund intended use plan (IUP). (1) As required by the EPA, the department issues a Draft IUP and a Final IUP for each funding cycle. (2) The ((Final IUP is issued in conjunction with the Final Offer and Applicant List. (3) It)) IUP contains a detailed report of how the department expects to allocate ((moneys)) funds available in the current funding cycle. WAC 173-98-300 Wastewater treatment facilities construction. (2) Service area population. Applicants with a service area population of twenty-five thousand or less can request ((hardship-funding)) hardship funding consideration by submitting a financial hardship analysis form along with the funding application. If the service area population is different from the population of the applicant, the applicant must show that the hardship assistance is solely used to benefit the population of the service area. (3) Existing residential need. The applicant and the department calculate the water pollution control facilities construction costs that are associated with existing residential need at the time of application. (5) Loan terms and interest rates. The department uses ((the loan hardship-funding continuum)) Table 1 to determine the ((hardship-loan)) hardship loan interest rates. ((Not more than fifty percent of the funding category can be awarded to any one applicant per funding cycle. In addition to a reduced interest rate, the applicant may receive longer loan repayment terms, not to exceed twenty years, and forgivable principal loans as specified in WAC 173-98-330. When an applicant with a service area population of twenty-five thousand or less can demonstrate that its sewer user rates for the proposed project are between three and five percent of the MHI, the applicant may be eligible for a twenty-year repayment term and a one percent interest rate. This interest rate represents twenty percent of the average market rate for tax-exempt municipal bonds (see figure 2). (6) Partially funded projects: If a project in the hardship category receives partial funding due to department funding constraints, the department may offer the remaining funding, subject to funding ceilings, in the next funding cycle((, and on a case-by-case basis)). The department may require further hardship analysis before offering the remaining ((moneys)) funds. WAC 173-98-310 On-site sewage system repair and replacement programs. (1) Applicants may apply for a revolving fund loan to establish or continue programs that provide funding for on-site sewage repair and replacement for homeowners and small commercial enterprises. (2) Final loan blended interest rate. The department may adjust the recipient's interest rates based on the ((interest rates)) proportion of loans that the recipient charged provided to homeowners ((and small commercial enterprises. To receive the adjusted interest rate, the recipient must issue loans shown in figure 3. (3) Figure 3 shows the interest rate schedule for loans targeted to homeowners at three levels of county MHI. For information on how the market rate is determined, see WAC 173-98-400. (4) Figure 4 shows the interest rate schedules for loans targeted to small commercial enterprises at three levels of annual gross revenue. For example, in order for a small commercial enterprise to be considered for moderate to severe hardship, the business must provide documentation to substantiate that annual gross revenue is less than one hundred thousand dollars. (5))) in accordance with Table 2. Loans provided to small commercial enterprises do not affect the final loan blended interest rate. (3) For the purposes of this section, small commercial enterprises are those with an average daily flow of less than three thousand five hundred gallons. (((iii))) (c) Below fifty percent of county MHI. (((1))) Forgivable principal. The department will ((apply the funding hardship continuum provided in figure 5 below)) use Table 3 to determine the amount of forgivable principal loan funding provided to an eligible hardship project. Financial hardship will be determined based on the provisions in WAC 173-98-300((. and the ceiling amounts in WAC 173-98-520. In addition, in accordance with the act, the department must consider unemployment for the purposes of awarding forgivable principal loan for hardship. (1) An applicant ((can request hardship-funding consideration)) will be considered for hardship funding when submitting a funding application if the service area population is twenty-five thousand or less and the MHI is less than eighty percent of the state MHI. (2) If the service area population is different from the population of the applicant, the applicant must show that the hardship assistance is solely used to benefit the population of the service area. (3) The most recent available American community survey data determines the MHI. (4) If MHI data are not available for a community then the county MHI in which the community resides will be used. (5) If the applicant disputes the data used by the department, the department may allow an applicant to conduct a scientific survey to determine the MHI for the project area. WAC 173-98-400 Loan interest rates. (1) Interest will accrue on each disbursement as it is paid to the recipient. This is "deferred interest." Deferred interest is added to the principal at project completion. (b) Taken from the period ((sixty to thirty)) one hundred eighty days before the ((annual)) funding application cycle begins. (3) See WAC 173-98-300 and 173-98-310 for hardship interest rates. (4) The standard interest rates for water pollution control activities projects are the rates calculated for "moderate" hardship in accordance with Table 1 in WAC 173-98-300. (5) The director may ((approve lower)) adjust interest rates for the ((annual)) funding application cycle if a financial analysis of the revolving fund demonstrates that ((lower)) the interest rates ((for that year)) are not detrimental to the perpetuity of the revolving fund. (((5))) (6) Prior to issuing its Final Offer and Applicant List the department will examine and may lower interest rates if the rates for tax-exempt municipal bonds are significantly lower than when the funding cycle interest rate was determined in accordance with subsection (2) of this section. (7) An administration charge will be applied to all loans that enter repayment after the effective date of this section. The following conditions apply to the administration charge. (a) The administration charge will be applied to the outstanding loan balance at the time of each payment. (b) The administration charge will be subtracted from the interest rate established in the loan agreement so there is no additional cost to the borrower. (c) The administration charge will not be applied to loans with interest rates less than the administration charge. (d) The maximum allowable administration charge is one percent. Initially the administration charge will be set at this level. (iv) Find that there is no need for any rate adjustments or balance transfers. (f) If the department determines the administration charge should be adjusted, it will increase (up to the maximum of one percent) or decrease the administration charge and apply the new administration charge to loans that enter repayment after the administration charge has been adjusted. Loans already in repayment will not be affected by the adjusted administration charge. (1) There are two kinds of refinance with different rules: Standard refinance and interim refinance. (2) Standard refinance refers to a completed project funded with ((moneys)) funds from a source other than the department. It is limited to water pollution control facilities where project construction began after March 7, 1985. (f) Repayment begins six months after a funding agreement becomes effective. (3) Interim refinance applies to a project that is in progress using ((moneys)) funds from a source other than the department. Interim refinance retires existing debt and also covers the remaining eligible project costs. Interim refinance projects must meet all applicable requirements of this chapter. WAC 173-98-450 Loan reserve requirements. ((For a revenue obligation secured loan with terms more than five years, the recipient must accumulate a reserve account equivalent to the annual debt service on the loan. This reserve must be established before or during the first five years of the loan repayment period. The reserve account may be used to make the last two payments)) The department may require a recipient to create a reserve account to secure the payment of the principal and interest on the revolving fund loan. In the event of loan default, the state of Washington may withhold any amounts due to the recipient from the state for other purposes. The ((moneys)) funds will be applied to the debt. A late fee of one percent per month on the past due amount ((will)) may be assessed starting on the date the debt becomes past due and until it is paid in full. (a) ((Green project reserves category: An amount equal to twenty-five percent of the capitalization grant is allocated to the green project reserves category. (((e))) (c) Water pollution control activities category: ((After allocating revolving fund moneys to the green project reserves category,)) Twenty percent of the ((remaining)) revolving fund will be available for the implementation of programs or projects established under the Washington's Water Quality Management Plan to Control Nonpoint Sources of Pollution. (((d))) (b) Additional subsidization in the form of forgivable principal loans may be provided for eligible hardship projects, eligible green project reserve((s)) projects or project elements, and eligible preconstruction projects. (3) If the demand is limited in any of the funding categories or to meet funding levels required in federal laws, the department can shift ((moneys)) funds between the funding categories. (1) Where applicable, the recipient must acknowledge department and EPA funding in reports, technical documents, publications, brochures, and other materials. (a) No more than twenty percent of the revolving fund in this category will be available to any one applicant per funding cycle. (c) The ceiling amount for this category applies to the combined total of all preconstruction elements for loans and forgivable principal loans. (c) No more than ((five)) seven million dollars is available for each smaller combined design-construct project (step four). See WAC 173-98-530 for information on smaller combined design-construct projects (step four). (4) Water pollution control activities category: ((Not)) No more than fifty percent of the revolving fund in this category will be available to any one applicant per funding cycle. (c) First priority for funding bid overruns will be given to hardship communities based on the severity of financial need. (((c))) (d) First priority for funding change orders will be given to hardship communities based on the severity of financial need. (7) If a project qualifies for both hardship funding and green project reserve((s)) funding, then the ceiling amount for total forgivable principal and centennial grant funding for the project is the combined ceiling amount of both hardship and green project reserve((s)) categories. (8) If demand is limited for projects eligible for any category, the ceiling amounts may be raised in other categories to fully use available funding. WAC 173-98-530 Step process for water pollution control facilities. (1) The step process is required for wastewater facilities projects. The process begins with site-specific planning, and continues through design to construction. (2) For steps one through three, an applicant may only apply for funding for one step of the process at a time. ((At the time of application, completion of the previous steps must be approved by the department.)) Funding of one step does not guarantee the funding of subsequent steps. (b) Design (step two): Step two includes the preparation of plans and specifications for use in construction. These must be based on the preferred cost-effective alternative identified in the ((facilities plan. A facilities plan)) planning document. In order to be eligible for design a planning document must be approved by the department ((before an application for design can be considered for funding)) without conditions at least thirty days before issuance of the Draft Offer and Applicant List. (c) Construction (step three): Step three includes ((the actual building)) construction of facilities based on the approved design. ((Design)) In order to be eligible for construction, design plans and specifications must be approved by the department ((before an application for construction can be considered for funding. The applicant must also have a current rate study that includes the proposed project before an application for construction can be considered for funding. The utility rate proposed in the rate study must be adequate to pay for O&M, debt service, and replacement of short lived assets, and any other associated project costs. The applicant must have an adopted fee ordinance based on the current rate study that includes the proposed project before the department will sign a loan agreement)) without conditions, in accordance with WAC 173-240-030, at least thirty days before issuance of the Draft Offer and Applicant List. (4) Combined steps for smaller design-construct projects (step four): In some cases, design and construction may be combined into one ((loan)) project. Step four applicants must demonstrate that step two (design) can be completed and approved by the department within one year of the ((effective)) signature date of the funding agreement. ((The applicant must also complete a rate study that includes the proposed project and adopt a fee ordinance based on the rate study before the department will approve plans and specifications as required in WAC 173-98-560, approval of plans and specifications. The utility rate proposed in the rate study must be adequate to pay for O&M, debt service, and replacement of short lived assets, and any other associated project costs.)) In order to be eligible for step four, a planning document must be approved by the department without conditions at least thirty days before issuance of the Draft Offer and Applicant List. The total project costs for step four projects must be ((five)) seven million dollars or less. (((b))) the proposed project would remedy this situation((. (b) The department has declared an environmental emergency, and the proposed project would remedy this situation. WAC 173-98-540 ((Step)) Process for water pollution control activities. WAC 173-98-600 ((Design-build and design-build-operate project)) Alternative public works contracting requirements. (((1) Design-build or design-build-operate)) Alternative public works contracting projects must be consistent with the applicable ((statutes, such as)) sections of chapter 39.10 RCW, Alternative public works contracting procedures, chapter 70.150 RCW, Water Quality Joint Development Act, and/or chapter 35.58 RCW, Metropolitan municipal corporations. (((2) The construction portions of a design-build-operate project under chapter 70.150 RCW, Water Quality Joint Development Act, may be eligible for reduced interest rate and a forgivable principal loan if the public body can demonstrate financial hardship in accordance with WAC 173-98-300. WAC 173-98-710 The Growth Management Act. (2) For the purposes of this section, "compliance with the Growth Management Act" means: A county, city, or town that must or chooses to plan under RCW 36.70A.040 and has adopted a comprehensive plan, including a capital facilities plan element, and development regulations as required by chapter 36.70A RCW. WAC 173-98-720 State environmental review process (SERP). (1) All recipients of funding for water pollution control facility projects must comply with the SERP. (2) SERP includes all the provisions of the State Environmental Policy Act (SEPA), chapter 43.21C RCW, and the SEPA rules, chapter 197-11 WAC, and applicable federal requirements. (3) All mitigation measures committed to in documents developed in the SERP process, such as the environmental checklist, environmental report, SEPA environmental impact statement (EIS), the finding of no significant impact/environmental assessment, or record of decision/federal EIS will become revolving fund loan agreement conditions. Failure to abide by these conditions will result in withholding of payments and may result in immediate repayment of the loan. WAC 173-98-730 Cost-effectiveness analysis ((for water pollution control facilities)). (1) Funding will only be considered if ((the)) a project is shown to be the cost-effective alternative/solution to ((the)) a water ((pollution control)) quality problem and that the project maximizes the potential for energy conservation and efficient water use, reuse, recapture, and conservation. The cost-effective alternative is determined using a cost-effectiveness analysis. (c) The cost of replacing the project or activity. (3) ((Facilities plans)) Applicants proposing ((design-build or design-build-operate)) alternative public works contracting for projects must demonstrate that this approach is the cost-effective alternative for procurement. WAC 173-98-800 Starting a project. ((Costs incurred before a loan agreement is effective are not eligible for reimbursement, unless prior authorization is granted by the department or interim refinancing is approved. For more information on interim refinancing, see WAC 173-98-410. (1) Prior authorization to incur eligible costs. (b) Starting a project means making any measurable step toward achieving the milestones, objectives, and overall goals of the project. (((c) Loan offers identified on the Final Offer and Applicant List will be effective for up to one year from the publication date of the Final Offer and Applicant List. Loan offers that do not result in a signed agreement are automatically ended, see WAC 173-98-220. (c) Other reasons as identified by the department on a case-by-case basis. WAC 173-98-900 Revolving fund perpetuity. (1) The act requires that the revolving fund be managed in perpetuity. (2) The department will strive to achieve perpetuity, as defined by WAC 173-98-030((, by 2016)). WAC 173-98-910 Accounting requirements ((for loan recipients)). (1) Recipients must maintain ((accounting records in accordance with RCW 43.09.200 Local government accounting—Uniform system of accounting.)) accurate records and accounts for the project in accordance with generally accepted accounting principles (GAAP) as issued by the Governmental Accounting Standards Board (GASB), including standards related to the reporting of infrastructure assets, or in accordance with the state standards in RCW 43.09.200 "Local government accounting—Uniform system of accounting." (2) Accounting irregularities may result in a payment hold until irregularities are resolved. The director may require immediate repayment of misused loan ((moneys)) funds. WAC 173-98-940 Insurance for water pollution control facilities projects. Recipients shall maintain comprehensive insurance coverage on the project for an amount equal to the ((moneys)) funds disbursed. (d) Demonstrate that the request is consistent with state and federal laws and rules. (2) ((Concurrences)) Determinations required in the environmental review process cannot be delegated to recipients. Declaration of construction after project completion.